The bloggers promoting this giveaway were not compensated. Host: Here We Go Again…Ready? Are you looking for the softest most awesome plush ever? 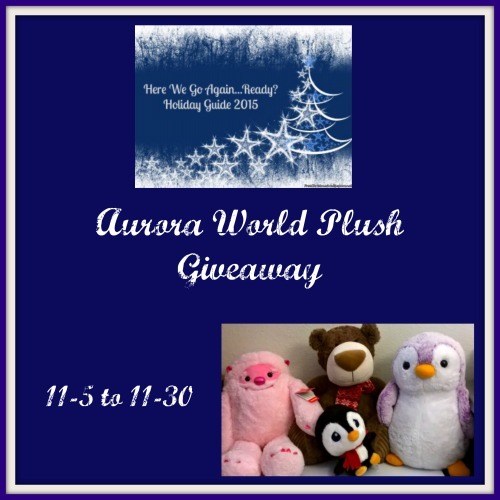 Aurora World offers a huge variety of amazingly soft plush. For the full review click here. One lucky reader will win the assortment of plush pictured!!! This giveaway is US, 18 or older. Only one entrant per household. Giveaway ends on 11/30 11:59 PM EST . Winner will be notified by email and has 24 hours to respond. If there is no response during that time a new winner will be chosen. Good Luck Everyone!!! The bloggers promoting this giveaway on not responsible for prize distribution. The sponsor will send out the prize. This giveaway is not associated with Facebook, Twitter, or any other social media. My daughter would like these toys!